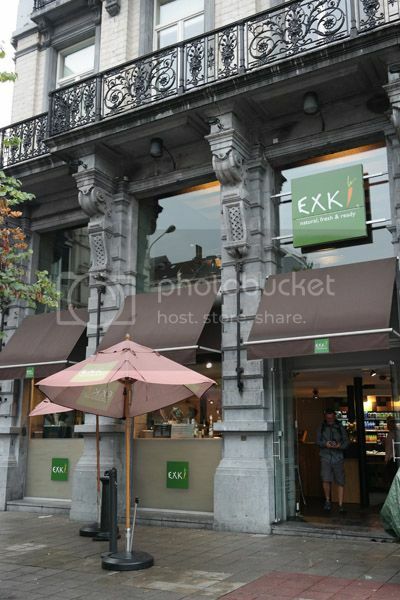 While in Brussels recently, we discovered a great restaurant and coffee shop chain called EXKi. As you can probably tell from the carrot on their logo, this is a place that focuses on fresh and natural foods. And since we prefer to drink organic coffee and tea, this was pretty much our go-to place when we wanted coffee in Belgium. The location that we frequented was the one at De Brouckèreplein 14 in Brussels, but we also popped into the one at Grasmarkt 93 since it is situated near the Grand Place. Just a note here – if you’re checking out the Grand Place, then you will notice that there is a Starbucks right there in the square, but the Grasmarkt 93 EXKi is only a couple of blocks away and well worth the walk. We also stopped in the location at the main train station in Brugges and in Gent city center, and they offered the same quality as we experienced at the Brussels locations. Coffee here is reasonably priced and has a nice, smooth taste. You can save a little cash by skipping drinking it in the restaurant as carry-out prices on everything are cheaper. This was by far the best coffee that we had in all of Brussels. And best of all, the cup sizes were almost equivalent to American sizes! The food here is pretty great too, especially if you prefer some healthy fare to balance out all the Belgian frites that you must consume while in Brussels. If you’re interested in the wi-fi situation, know that it is free and no password is required. However, you are limited to just 30 minutes of access. Want To Roast Your Own Coffee At Home?